Fall is the perfect time to take care of your new or existing lawn to ensure a good start for next season. You may wish to start with an assessment of your lawn’s growth, and any problems that might have developed over the summer months. Take a look at areas where growth is slow or patchy. This may indicate an underlying pest problem, a less-than-optimal soil base to support growth, or a need for a different type of grass to be seeded. Adding seed may require a trip to the lawn and garden center to get some ideas for grass seed that is better suited to certain conditions. Sometimes a blend of fast growing seeds to establish the lawn and slower growing seeds to develop good roots can be set into problem areas and jumpstarted before cooler weather comes. You’ll also want to ensure these patchy areas receive enough water; a little remedial sprinkling may be all that’s needed if natural rainfall levels are low. 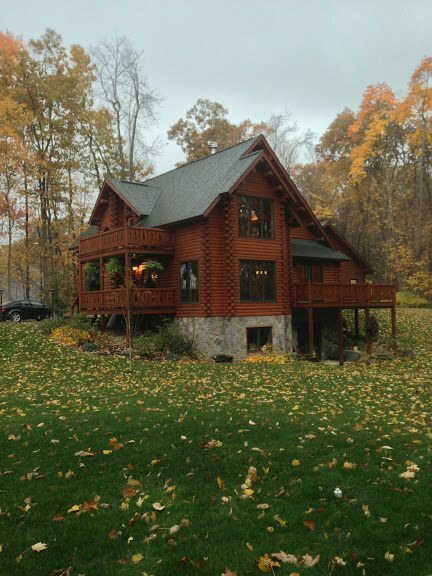 If you’ve just carved out a new lawn upon completion of a new log home, you may find that the soil needs some organic matter and lime to sweeten the soil and improve growth. Sweetening with a good dose of lime is especially important for new sites that were previously wooded, as trees can render soil very acidic. 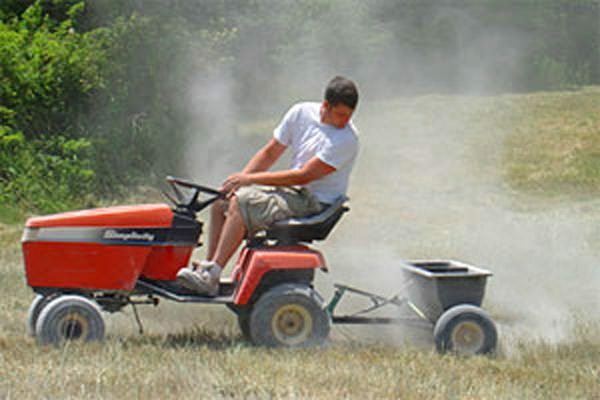 Lime can be spread using a simple spreader behind a riding lawnmower or pushed by hand. 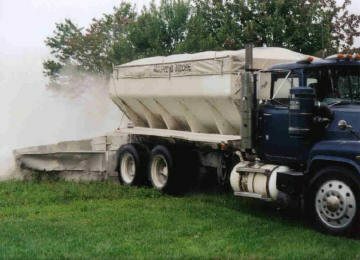 A local farmer may also be able to identify a vendor that uses a spreader truck to distribute lime if you need to cover a particularly large area. Try to time the lime application to occur just prior to a good soaking rain. Adding organic matter may be a simple as not collecting grass clippings while mowing, allowing them to decompose and recycle back into the grass. If you have access to a mulching mower, they shred the clippings much more finely for better assimilation into the turf. An organic fertilizer made from recycled organic matter may need to be spread lightly through out the lawn. If you do plan to use a commercial product, read the label and try to avoid mixtures that have too many chemicals that may affect pets and humans alike. 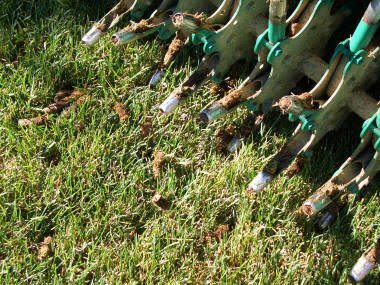 If the lawn is reasonably well-established, thatch and compaction may keep the grasses from receiving as much water and nutrients as necessary. A metal rake can scratch up thatch, but if thatch is well established it may pay to rent a thatching machine. These machines resemble a lawnmower, but use teeth (see left) to loosen the dead grass from living plants and lift it out to the grass. It is recommended that you adjust the teeth settings relatively high at first to see how much that materials you are able to dislodge; the teeth can always be reset to loosen more material. 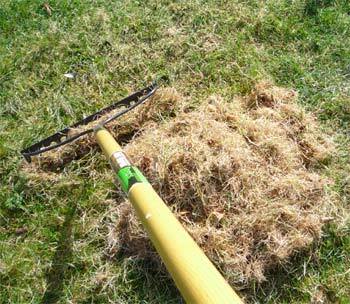 Once the thatch is combed out of the lawn use a leaf rake to remove the material. If your lawn has a heavy thatch issue, you’ll want to remove the thatch prior to fertilizing or applying lime. Identifying specific grubs in your lawn can also determine the treatment. Visibly, grub infestation can be seen in large brown patches (see below left), particularly where birds or rodents such as moles are seen feeding. Dig up a small portion of the lawn and the grubs will be evident in the root systems. 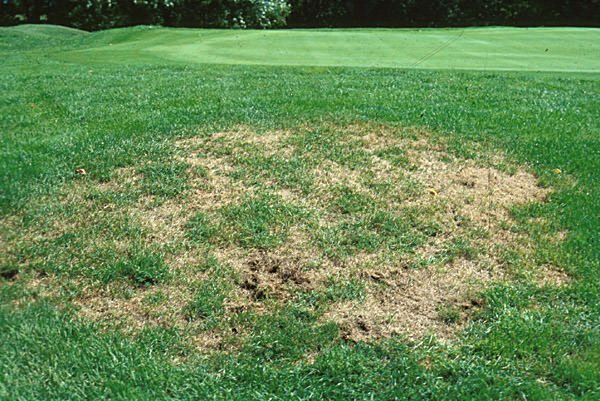 Many beetle species respond well to a treatment of milky spore, which will inoculate the lawn for several seasons. Applying beneficial nematodes (a microscopic worm) will also help to kill off beetle grubs, along with other insects that can live in grass and affect plants.. Nematodes can be ordered and applied via a pump sprayer. When taking a look at maintaining your lawn, it’s also a good idea to take your lawnmower in for an end-of-season check-up, to ensure belts, plugs, and other essential pieces are in good working order for the coming spring mowing. Other lawn equipment such as trimmers and edgers may also need a cleaning and maintenance review.